MANILA, Philippines – For a very rare occasion in a PBA semis event, the Alaska Aces swept the Purefoods Star Hotshots 3-0 in the semis of PBA Governors' Cup best-of-five duel to the tune of 82-77 on Sunday, July 5, 2015 at the Smart Araneta Coliseum in Cubao, Quezon City. With Purefoods’ one foot already in the grave, they will do everything that they can just to stay alive and extend the series. The Hotshots got the first possession of the ballgame and quickly converted it into a three-point basket care of James Yap who had a great series run. Joe Devance backed-up Yap with his own style of three-pointer. Surprise starter, Rookie Rome Dela Rosa on the other side of the court, made a back-to-back layups combined with Sonny Thoss’ defensive stoppage on Yousef Taha and Marqus Blakely. Marc Pingris who was very vocal on pin-pointing their flaws for the past 2 games looked rejuvenated and yearned to extend his team’s season turned garbage into gold several times. James Yap ended the opening quarter in a high note with his 2nd trey. Yap and his comrades were up, 23-16. Purefoods’ lead started to pile up little by little on the early phase of the second quarter courtesy of Mark Barroca and James Yap. “Big Game“ had 3 triples in the first-half for 3 out of 5 or 60% shooting for a total of 15 early markers. The Hotshots posted their 1st double-digit lead of the game, 44-34 at the 1-minute mark of the game. However, their import got into early foul trouble for committing his 3rd personal foul. They headed to the locker room with a 9-point, 46-37 lead. The Aces know how dangerous Hotshots can be so Coach Alex and his boys were not giving their rivals a chance to get away with big amount of lead that could jeopardize their bid for the first finals berth. Calvin Abueva and JV Casio immediately fought back for 5 points combined that caused Coach Tim Cone to call his 1st 3rd quarter timeout to re-group his squad. For the second straight time, Tim Cone burned another 30-second timeout as the Aces finally came back in less than 4 minutes courtesy of Dela Rosa, Casio and Abueva. Alaska grabbed the lead 49-48. But Yousef Taha didn’t waste any time in re-acquiring their margin as he drained 2 successive shots. 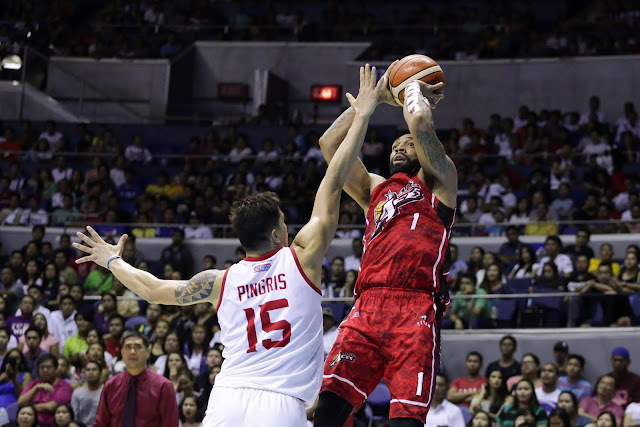 Romeo Travis scooped a lefty shot for the first deadlock of the game 56-all. Travis intercepted a pass off a Purefoods transition and handed it to Abueva for a fast break layup. But Blakely trailed Abueva from behind for a chase down block ala Lebron James that could possibly one of this week’s top 5 highlights. The Hotshots made a 9-2 run, majority from Alex Mallari, as they closed the 3rd period with a 5-point, 65-60 lead. Vic Manuel made some noise by beating big man Mic Pennisi in a foot race that resulted into a break away one-handed slamma jamma. Romeo Travis hit a long shot for the 2nd deadlock of the ballgame. The Aces got a defensive board and Vic Manuel, who was the best player of game number 1 drove hard to the basket for the lead 71-69 under 7 minutes of the 4th. Yap, Taha and Blakely combined efforts to bring their lead 77-74 back with 2:45 remaining on the game clock. Travis made short jumper followed by a cold-blooded three-pointer at the 2-minute warning for a 2-point 79-77 lead. Hotshots’ hope slowly dimmed as they started to miss their shots and gave the defensive rebounds to the Aces. But they got a break after Travis threw the ball to the other half of the court off an inbound pass. James Yap tried his luck from the outside for a chance to take the lead but he widely missed. Aces got the board and Manuel gave his team a two-possession lead, 81-77 with a baseline jumper. JV Casio put the icing on the cake by splitting his charities after a duty foul from Marqus Blakely. Rookie Rome Dela Rosa won the Best Player of the Game with 11 points, 2 rebounds and 2 steals. Alaska now awaits the winner of SMB-ROS series for the conference finals.